Do you look in your bead stash and want to sit down to create but find yourself overwhelmed by years of purchases and too many choices? My dear auntie was in need of inspiration for some upcoming shows so I suggested this muffin challenge to her as a way of breaking through being overwhelmed by a stuffed craft room. Fill the cup of a muffin tin with everything you need for one project - so the focal bead, accents, chain, findings - whatever you would need to complete one project and put that in one cup. Repeat with the other 11 cups. You now have 12 projects in a portable container ready for you to put together. Grab your pliers/tools and sit somewhere comfy with your muffin tin and put each piece together knowing all your choices have already been made - your mission is to simply arrange those beads in a sassy design and complete those 12 projects as quickly as possible! So let's play! Grab a muffin tin and put together 12 projects by June 27th (Midnight CT). Yes, 12 projects in a week - you can do it! 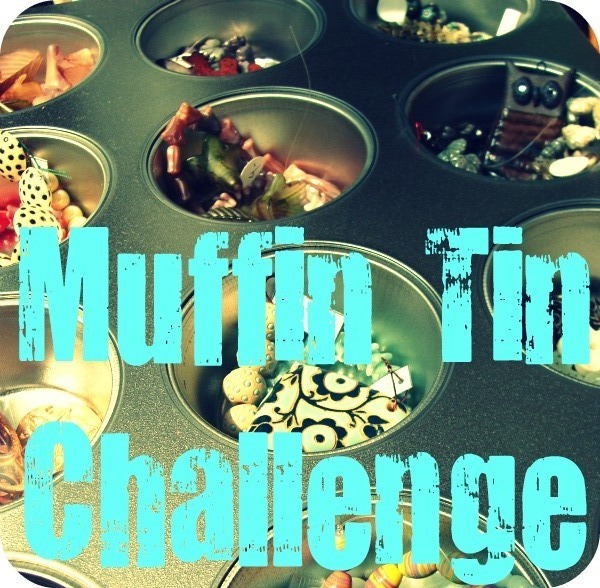 Take a photo of your muffin tin and one photo of all 12 projects - blog, facebook or add it to a free album like Flickr and share the link below. On the 28th, I will pick one winner to receive a Bead & Button grab bag from me valued at over $75, it will include art beads and some awesome goodies from the show. *Addendum - if you complete 6 projects you can enter! 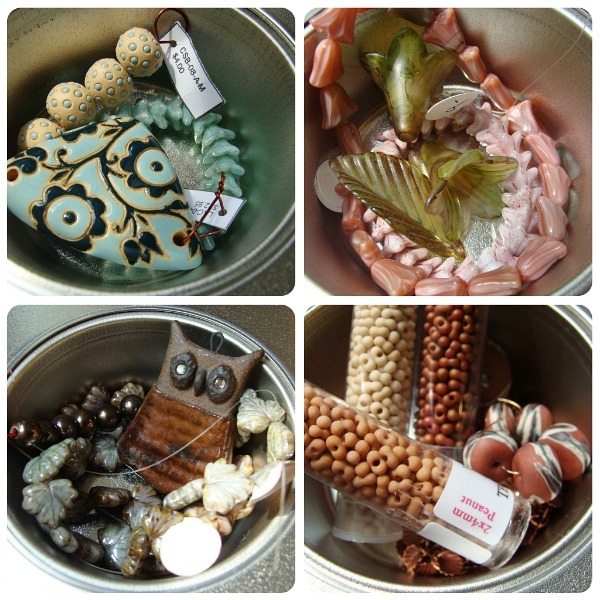 Pictured above are Rosanne's treasures from Bead & Button and include art beads from: Golem Beads, Vintage Meadows, Lisa Peters and Humblebeads. I can do this ONLY if UFO's count. They can include projects you have started - it coul also be 12 earrings or pendants. So much FUN, I'm gonna give it a try!! I can't decide!!! Today is the last day of school here - will I have enough sanity to do this??? Ahh Darn, I would love to participate in this challenge, but unfortunatly I'm moving this week and even though I will be moved by the 26th I will not be organized enough to get 12 pieces done by the 27th. Happy creating to all of you that are going to do this challenge, I'll catch the next one. I love this, since my "studio" is in disarray, what a great project. Thanks for the inspiration. What a great idea! So many times I go to my bead boxes and immediatly get overwhelmed on where to start. I want to try this but it just isn't possible right now, but I can't wait to see what everyone comes up with. Great idea! I've always got a dozen ideas in my head that never materialize. I may not get it done in a week, but I'll do it anyway for a laugh. Really really REALLY want to take part in this...but I'm in a similar position to Therese, moving house and need to concentrate on that :( Looking forward to seeing the makes and will try do my own one once I'm settled in! Sounds fun. May have to try this one. I already have a muffin tin started...whenever I see two or three beads that look awesome together because of a happy accident on the table I put them over in the tin to await being "filled out" for a whole project. So, I'm gonna get'em done! This is a great idea, not only the challenge but the advice too. Everytime I go through my purchases I really cannot decide what sould I pick and where should I start from. Putting together the beads before working is simply an instinctual, aesthetical act that could work for me. Unfortunately I won't take part in this challenge, but I will surely look at the final projects. What a cool idea - have to search for that da*** tin! Great idea! I have loads of half finished projects lying around and a few new bits I'd like to put to some use. Will have to have a try! Now to find a muffin tin! Ooohh, I like the 'muffin tin' idea! Just love playing, sorting and re-araranging all my beads, in groups, but It would take me a week to make one, forget 12~ LOL! Jen V..that's a great idea! Looks like fun...but I'm swamped right now! Looking forward to seeing everyones projects! What a great idea! I'm gonna try it, just what I needed! What a great idea. I will give it a try. I can't believe the Golem beads were only $4.00~! I am sure I paid more for mine. Maybe the show had better deals. I like what Jen V. just said about keeping the beads together when you have a happy accident. That is a great idea too. I am excited to see what everyone does! Okay! Now I get what all this muffin tin talk is all about! I am not sure that I will have time to play but what a GREAT way to organize your stash! I am going to pick up a muffin tin (oh heck, just use one from my cupboard! It isn't like I am doing any baking!) and set up my goodie and stash that way. Super idea girls! Great idea, and perfect timing: I'm house-sitting for a friend up in the mountains and need an easy way to bring some projects up here without lugging up my whole mess. Problem solved, and a fun challenge to boot!! I can't wait to see what everyone makes! Oh, I wish I didn't have so many deadlines to meet right now! This a fantabulous idea! I hope you'll do it again Heather, I would love to join in. Can't wait to see what everyone makes! This is the perfect kick in the lower regions that I need to get going on a bunch of half-finished projects and various bead groupings that I have scattered all over the place. Creativity and de-cluttering in one fell swoop! I love this challenge! My muffin cups aren't big enough though, lol. I'm going to have to put the whole thing in a box so stuff won't fall off the top of the muffin tin. And I doubt I'll get it all done by the 27th due to going out of town for a show but it will be fun anyway. What a great idea. Regrettably I'm not within easy reach of my total bead and findings stash so no way I can do it this time. I'm going to have to get a tin to start collecting "matching" beads! Can't wait to see what you all come up with. I got out a muffin tin and started cleaning up, spare beads, half beaded cabochons, etc. It was great and productive, but then I found this wonderful sun cab and started beaded a cuff...no way I can get anything else done. But what inspiration this was! Whew! I waited a bit longer than I should have to jump in to this great project, but my muffin tin is now full and I'll be beading like crazy until Monday! AMAZING idea, Heather! Thank you so very much for igniting our creativity! What a terrific idea...I often put combos together and just stare at them too long...love the idea of getting 12 done in a week...great challenge! All done! That was fun (and challenging)!!! The first few were easy, but then the last few were hard!!! I put the photos on Flickr & my blog! Will be adding my finished pieces tomorrow! Really enjoyed this, thanks for the inspiration. I have finished my Muffins. I can't add my blog to the list where it says "Links to this Post" because it only accepts blogger and I have a different blog, I don't use that server. I'm done! I took the tiny way out of this challenge with some mini muffins and earrings but they're all done and I'm tickled with the results!! I don't know what's up with the post a link thingie, but all the links seem to be to posts that are two or three years old. I couldn't figure out how to get it to work. I've posted pictures of my revised muffin tin and the six things I've completed so far on flickr. A blog post will be up at www.nostoneunstrung.com shortly. Tried to add a link yesterday but it doesn't appear to have worked. Another "whew!" because I am done! This was a great challenge, Heather, and I am going to use it in the future to get myself creating bigger quantities at once. Plus, it finally got me over my intimidation of actually using my art beads! Thank you, thank you!! Loved this challenge! Thanks for sharing such a great idea. Here's my reveal post. The original "before" post is here. All done! I really enjoyed this challenge, it really focussed the mind! I'm not really sure what you mean by adding a link but hopefully you have all the information you need here. I've loved this challenge! I am finished with my projects and put up my blog post! I am so proud of myself for not stopping at 6 and making all 12. What a great project. I had no choice but to use what I had on hand! would help if I included the link huh? I thought I left my link here, but I don't see it on the list so I'm leaving it again. You can delete this if I'm doubling up. This was a fun challenge. I finished 11 necklaces. ::pant, pant, pant:: phew, I made it...gahhh! You can't leave a link unless you blog with blogger--I use WordPress. So if you'd like to see my challenge post, please cut and paste this address into your browser bar. Thanks!